Four soothing soundtracks to help you fall asleep, stay asleep, and wake up rejuvenated. Sleep is vital to your health and well-being, yet millions of us don’t get the sleep we need to live healthy and productive lives. 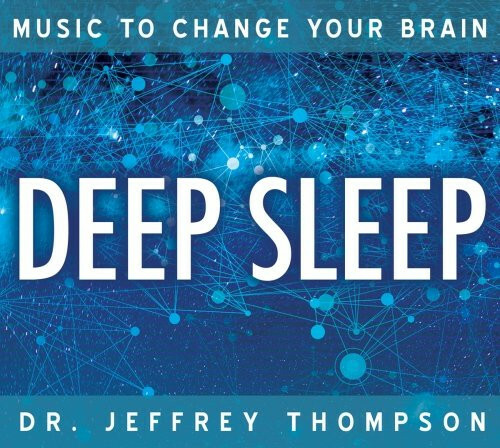 Dr. Jeffrey Thompson’s breakthrough musical system, developed over 20 years of clinical research, is proven to lead you to deep and restful sleep. His approach, based on brain science and sleep research, uses unique recording processes that naturally alter your own brainwaves to induce deep, rejuvenating sleep. You simply listen—on headphones or any stereo speakers—and your brainwaves lock on to inaudible pulses embedded in the soundtrack that quiet your mind and ease you into sleep. This collection of recordings features Dr. Thompson’s brainwave system embedded in soothing musical soundtracks and in pristine recordings of nature. The musical compositions are by Dr. Joseph Nagler, professor of music therapy and former director of research at New York University’s Rusk Institute of Rehabilitation Medicine. CD 1 Dreamy Music for Sleep—Soothing guitars, beckoning flutes, and glistening harps whisk you naturally into restful sleep. CD 2 Soothing Music for Sleep—Tranquil acoustic guitar, resonant cello, and harp engulf you in peace and carry you gently to sleep. CD 3 Sleepy Ocean—Soothing sounds of the Pacific Ocean surf rolling onto a pebbled beach. CD 4 Sleepy Rain—Gentle sounds of rain falling and dripping slowly from leaf to leaf. Over 1 million individuals worldwide use Dr. Thompson’s audio programs. I have found all products purched from sounds true excellent and good prices..(thank You) with the exception of Fall asleep,stay asleep...this one i found hopeless...but overall love sounds true.